Brewed my second batch of homebrew ever. It was the same bbq wit as before, with fresher spices. I’m hoping it turns out as awesomely as the first batch. The second batch is harder though because sanitizing becomes that much more important. I’ll know in a week and a half. 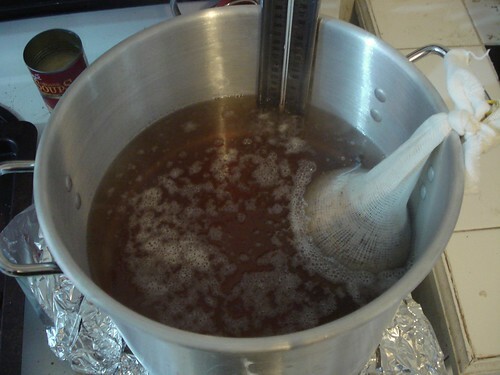 I followed the basic outline for brewing an extract beer from beerdude, which worked really well last time. Here’s it steeping some grain. America’s test kitchen is awesome. Cook’s Illustrated is my favorite print magazine. And, their recipes totally rock(America’s Test Kitchen Family Cookbook is a great reference). They are also composable, the recipes I mean. 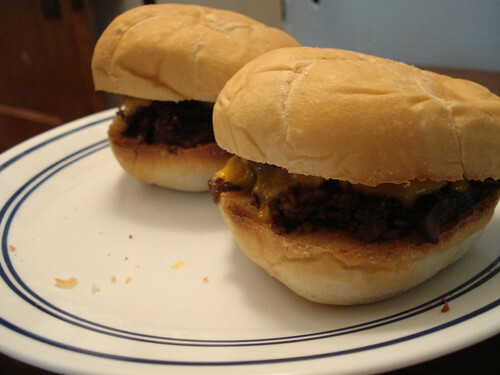 Behold Sara and I’s creation, the beef brisket sandwich. We made a rub (Basic BBQ Rub pg 399), and used the recipe on page 401 for BBQ beef brisket as inspiration. Inspiration, because we a) don’t have a BBQ and b) it was raining anyway. We let the rubbed meat marinate overnight in the fridge and put it in the oven after we woke up, around one. We used this pretty awesome dutch oven that we got from the previous tenant and used the Slow Roasted Beef pg 348 recipe as a guideline for the roasting. Then added a few more hours till the brisket was ‘fork-tender’, which I translated to falls apart with little prying. While that was going on we made BBQ sauce(Texas-style Barbecue Sauce pg 634). 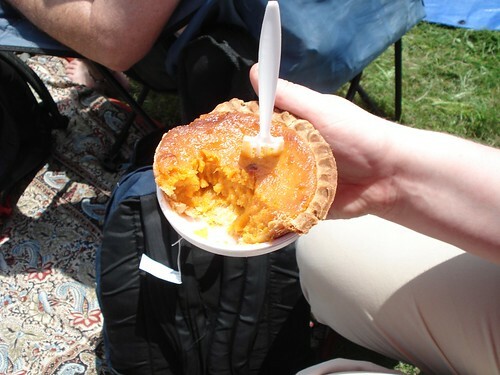 At first we didn’t cook it enough so it was too vinegary, but some more time over the heat mellowed it and let the sugars from the molasses break into more palatially interesting compounds. Also, I made some sauce from the deglazed frond(French for the gunk on the bottom of the pan) that had some real kick due to all the spice that was in the rub. Spicy. I’d call it a success. 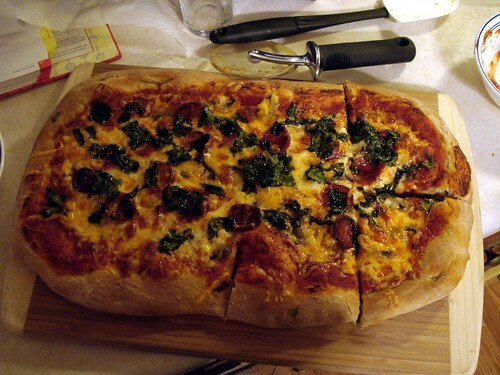 In honor of the pizza I ordered last night, the pizza I wish I had made again. 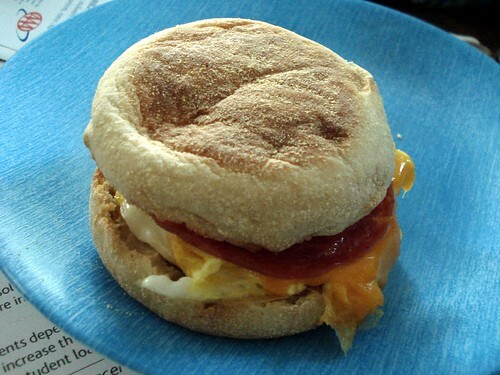 Lagniappe: Salami and Egg on an English Muffin. It was good too. Check out my flickr account for some more. The day started in the race track’s stands listening to an interview with Pete Seeger. While I was there I wrote down some interesting things I heard him say. In the same answer he talked more about why he likes to chop wood. 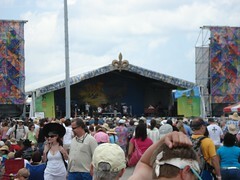 From there we went to the Gentilly Stage where Papa Grows Funk was playing. We listened/danced to a couple numbers but I wanted to hear some blues so we crossed the fair grounds to listen to part of Guitar Slim Jr.’s set. We made our way around Congo Square and looked at the vendor’s wares. 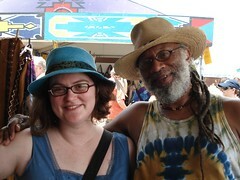 We stopped and chatted with Z of Z’s Tye Dye and bought some tye dye shirts from him. He makes good stuff and has been around for a while. Finally we ended up at the blues tent in time to listen to Guitar Slim wail on his instrument like any good blues man should. It rocked. But, it also was standing room only. 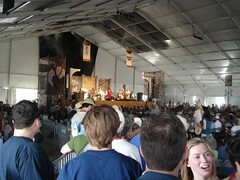 And soon it was time to meet up with Sara’s parents at the Economy Hall tent to listen to the Pfister Sisters. 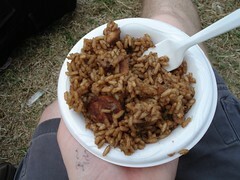 After listening/dancing to the Pfister Sisters, we were hungry again, so we got some real jambalaya. It was a lot less moist than I make it and used no tomatoes. What is called a brown jambalaya. Dare I say Yum Yum? I dare. While we were eating jambalaya, the Pine Leaf Boys were playing. So, we did what anyone would do in such a situation. We Fais Do-Doed it up for a while. 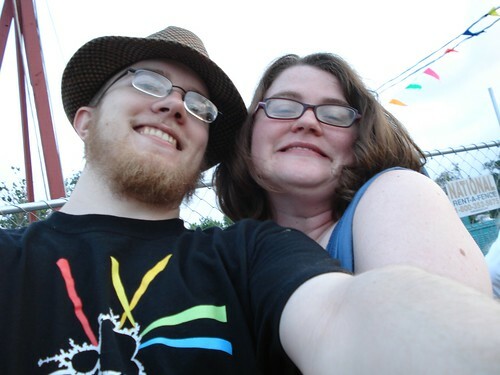 From there, we made our way to the Jazz tent to listen to Terence Blanchard. On the way there, song of New Orleans Allstar R&B Review(I read in the Times-Picayune the next day that it was the good bit) . The jazz that the band played was very much modern jazz. Not the sort most people could dance to. But everytime I felt ready to leave, I would hear something more that made me want to stay and keep listening. Until we got up that is. 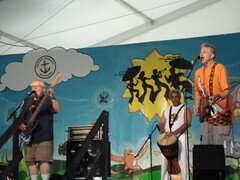 We got up to go back to Economy Hall to listen to Dr Michael White and his band play some traditional jazz. There were people dancing there again, like at the Pfister Sisters. 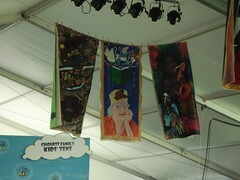 Then we skipped over to the kids tent and listened to Trout Fishing in America, which was totally awesome. 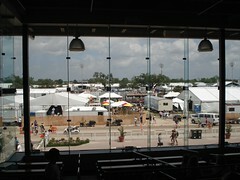 I wanted to see Earth Wind and Fire so we went out to the track and walked around to avoid the crowds. We stayed there and listened to a few songs, but Earth Wind and Fire was too mellow a way to end such an awesome day. 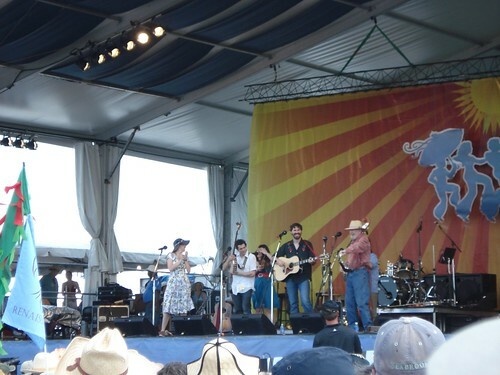 We went back to the Fais Do Do Stage and listened to Chubby Carrier and the Bayou Swamp Band close out the evening and danced till we were out of breath. 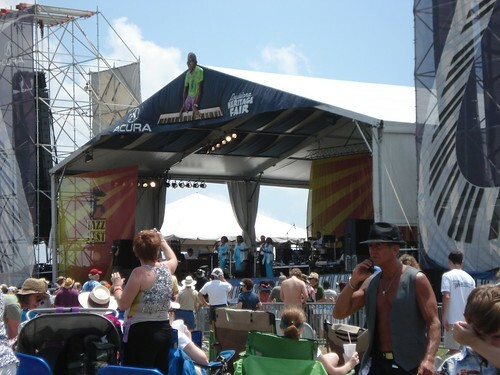 On the second day of Jazzfest, I stayed at the Acura(main) stage all day. I saw the Dixie Cups. 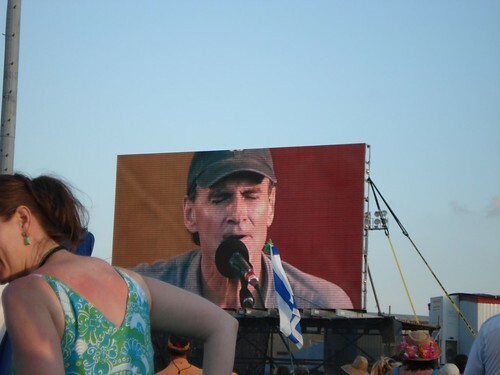 I saw Pete Seeger(who was one of the main reasons we picked the first weekend). 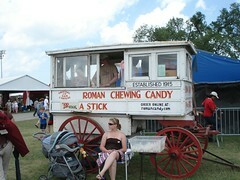 I also ate a bunch of interesting things. 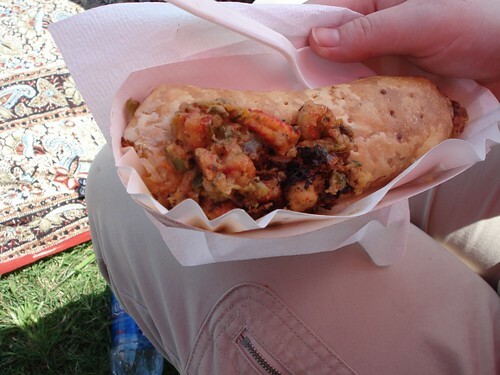 And crawfish strudel. 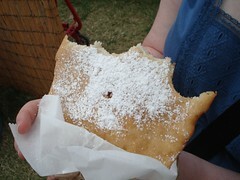 Mmm, that flaky crust. 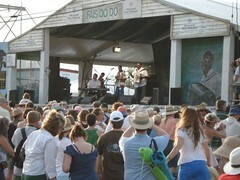 I am in New Orleans for the Jazz and Heritage Festival, more often known as Jazzfest. I am planning on taking some pictures and posting them here, but don’t expect me to be blogging reliably fro the next few days.